The University Chorus sings music from all genres including classical, spirituals, Broadway, contemporary, popular and folk songs. No prior experience is needed to join--only a willingness to learn during class about the basics of music reading and vocal production. It's like having voice lessons every rehearsal! 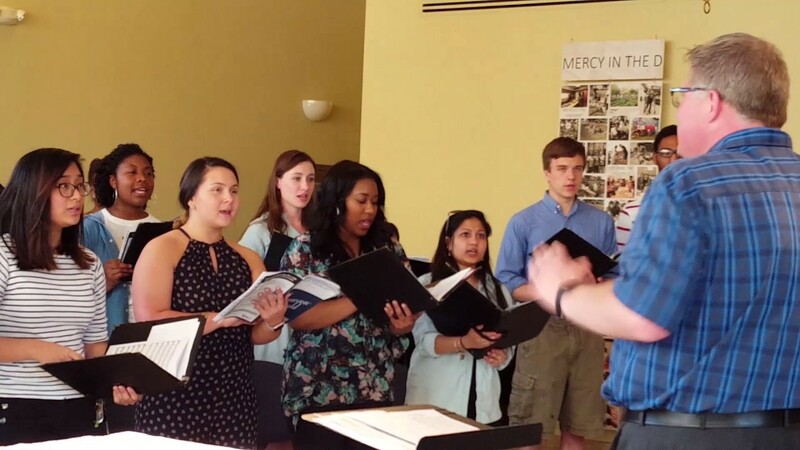 Singing in the University Chorus provides students with an opportunity to grow as musicians, as performers, and as vital art advocates in the community. Registration is required in MUS 1000 for one credit or audit. Daniel Greig is an adjunct professor of music. He conducts the University Chorus and has worked in University Ministry as the liturgical musician and choir director for Liturgies on campus for the last 15 years. He holds a Master of Music in Conducting, and a Bachelor of Music in Education from Wayne State University. He has music directed more than 100 musicals in his career at many theatres throughout Metro Detroit including shows at the Bonstelle Theatre and the Gem and Century Theatres among others. He has 17 years' experience directing choirs and teaching music in various capacities including 10 years of experience as co-director and music director of the Roeper Summer Stock Theatre. Active in the ACDA (American Choral Directors Association) and the MSVMA (Michigan State Vocal Music Association), Greig is training to be an adjudicator for Choral Festivals across the State of Michigan.